When a 180-foot ship marked with the words “U.S. ENVIRONMENTAL PROTECTION AGENCY” docks on the shores of one of the Great Lakes or their connecting channels, people take notice. 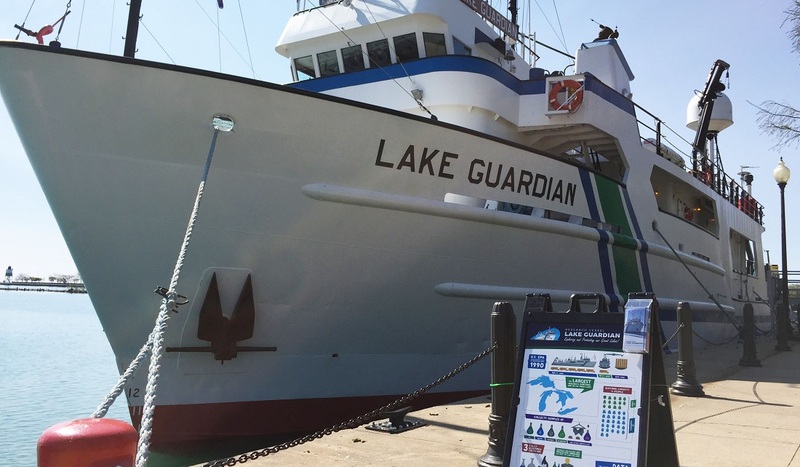 The research vessel Lake Guardian has incited curiosity for over 25 years as it has carried scientists across all five Great Lakes to collect and analyze samples of water, aquatic life, sediments, and air. Last year, IISG completed a project to answer frequently asked questions about the ship and to communicate the important work done on board to monitor and protect the world’s largest surface freshwater system. Allison Neubauer, Joel Davenport, and Kristin TePas received an APEX Award of Excellence for the colorful display they created about the R/V Lake Guardian. Easily transported and exhibited from one port to the next, the display is made up of two large posters that use graphics and accessible language to communicate key facts about the ship, such as its size and berthing capacity, and provide a glimpse into the scientific sampling processes and Great Lakes research topics that the vessel facilitates. Since making its debut last spring the display has proven to be a hit with people drawn to the ship. In particular, the eye-catching infographics designed by Davenport have been the subject of praise.